A Bombardier TRAXX locomotive of the first generation (class 146.1xx) with a fitting rake of Bombardier double decker coaches. 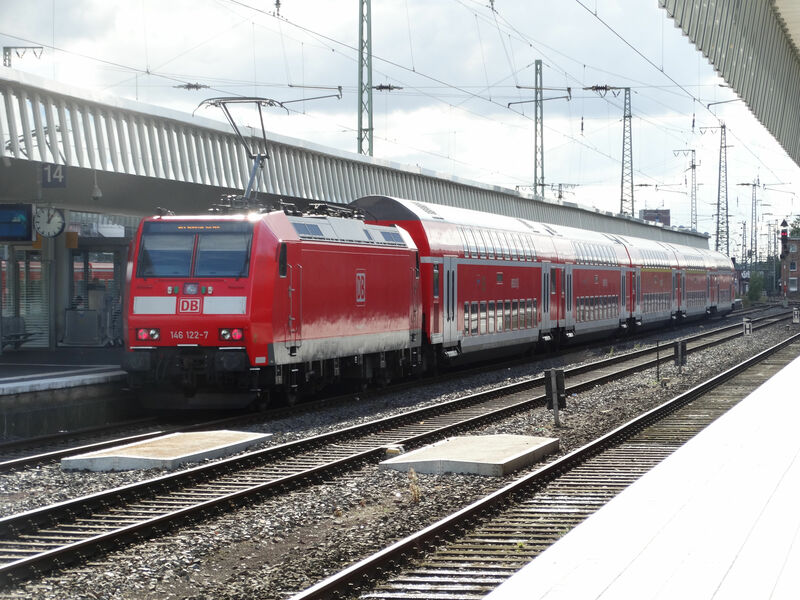 This is a very typical DB AG regional train in 2016. 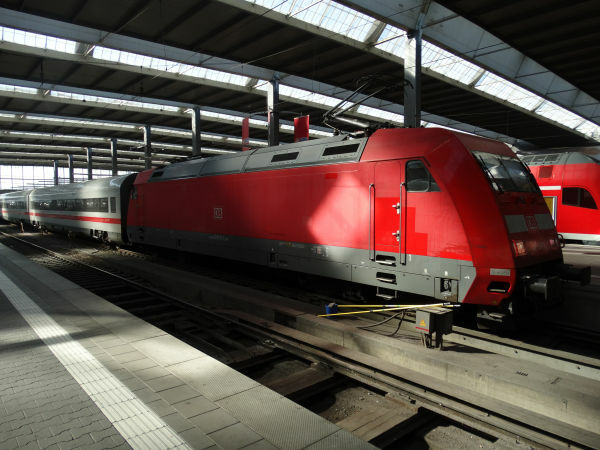 Compare with the IC2 train shown on the title page of Germany. Photo at Muenster Hauptbahnhof 8.10.2016 by Ilkka Siissalo. 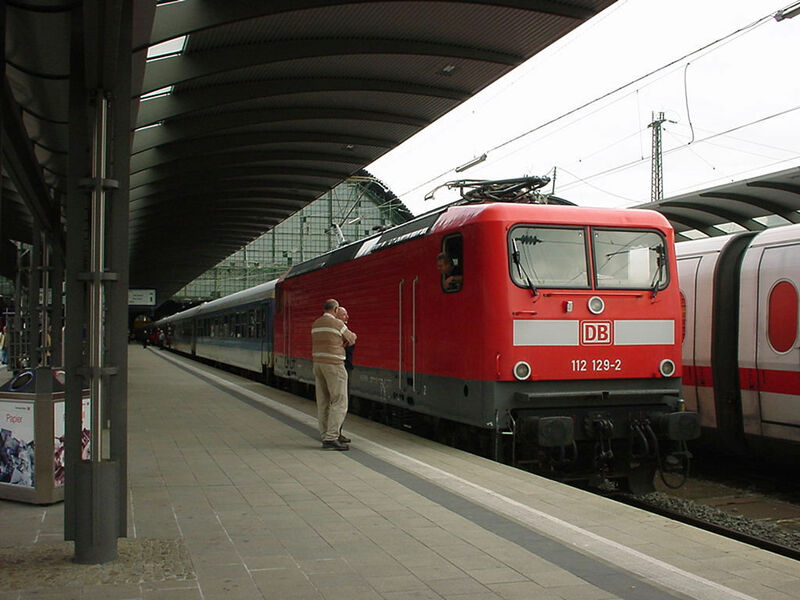 The Baureihe 101 is nowadays the most common long distance express and InterCity train locomotive of DB in Germany. The design is already fairly old and preceeds all the current Bombardier and Siemens designs. These locomotives were built by ADtranz before it was integrated into Bombardier. They were built in 145 copies in 1996-99. It is a single electric system (15 kV 16,7 Hz) locomotive. Its top speed is 220 km/h and the power rating is 6400 kW. Picture at Münster Hauptbahnhof 8.10.2016 by Ilkka Siissalo. The same train as above. Note the first coach after the locomotive, which is an InterCity driving trailer. This was one of those IC trains where there is a locomotive at both ends of the train and not just the usual push-pull operation with just one locomotive and a driving trailer. The reason was extra wagons due to a very busy time. Picture at Münster Hauptbahnhof 8.10.2016 by Ilkka Siissalo. 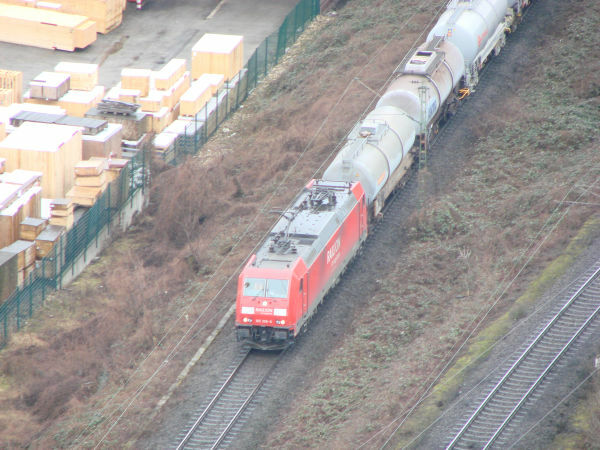 DB has nowadays a lot of locomotives totally covered by advertisement tapings. This one with the text Zeit für Gold (time for gold) was avertising the 2018 winter olympic games and the fact that DB was one of the main sponsors of the German team there. This is a very normal Br101 locomotive leading here an InterCity train. Picture from Rosenheim 13.3.2018 by Ilkka Siissalo. 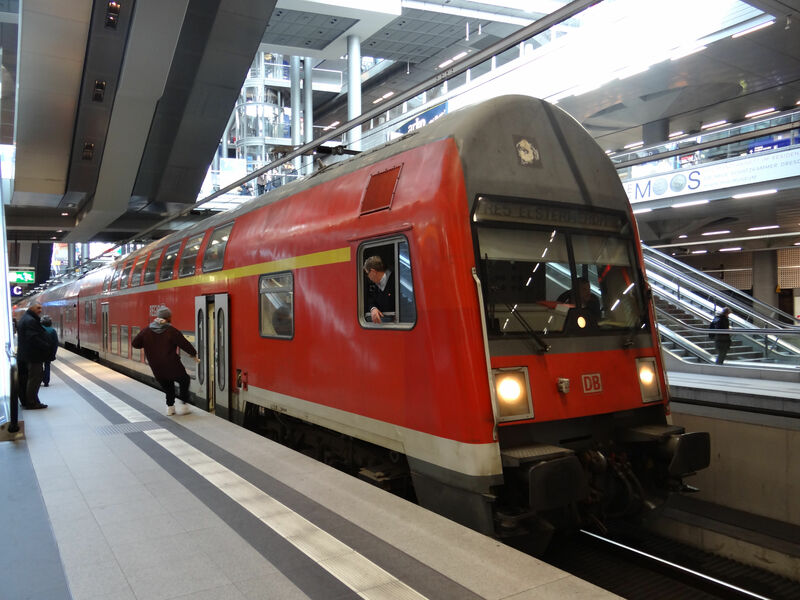 A very typical German InterCity train being pushed drivers cab coach first and locomotive last out of the Augsburg Hauptbahnhof station towards München. Picture from Augsburg 11.10.2015 by Ilkka Siissalo. This is a very special train. 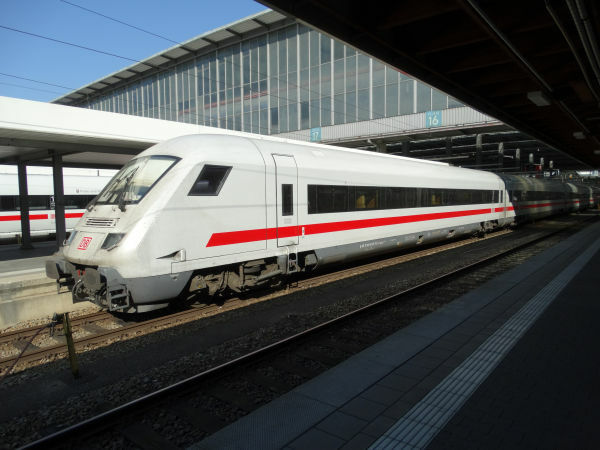 For some time DB tried to establish a premium priced, specially silver painted luxury fast train between Hamburg and Köln with a 220 km/h speed, almost no stops and with specially built luxurious coaches with a train attendant devoted to each coach. It had the marketing name and logo of "Metropolitan". See en.wikipedia.org/wiki/Metropolitan_(train). 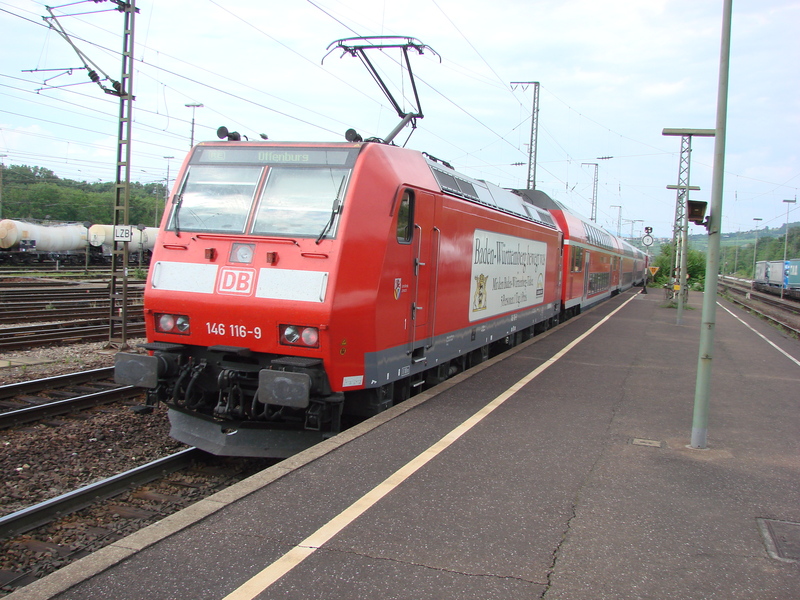 The operation lasted 1999 to December 2004 until DB gave up. Not enough people wanted to pay a premium price for a service which was in no way better than the normal ICE services. Afterwards the coaches and locomotives were painted in normal InterCity colours and taken into normal IC train use and later into ICE use. 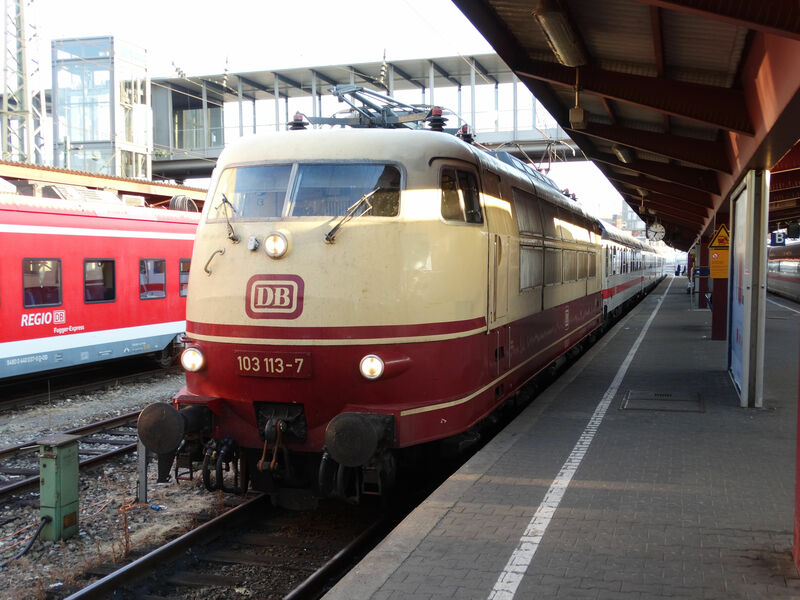 Today the two existing ex-Metropolitan coach rakes are the only locomotive driven ICE trains in Germany. This is one of the two ex-Metropolitan trains. Look at the coaches: no door at the front on one side, it is painted like an IC coach, but actually it is derived from an InterCity Express ICE 2 coach and now used in ICE traffic. 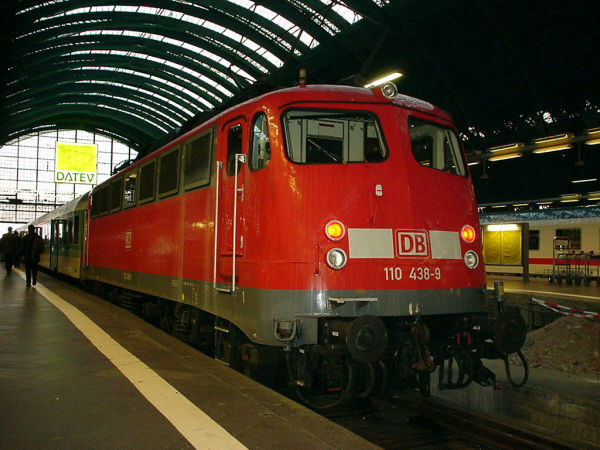 The Br 101 locomotive is also no longer Metropolitan silver grey, but normal "verkehrsrot" red. Picture from München Hauptbahnhof 13.9.2016 by Ilkka Siissalo. Another picture of the special ex-Metropolitan coaches. Pressure tight, fewer doors, derived from ICE 2 coaches, running as an ICE. Picture from München Hauptbahnhof 13.9.2016 by Ilkka Siissalo. A view of one of the two existing former Metropolitan trains, now running as a locomotive driven ICE. 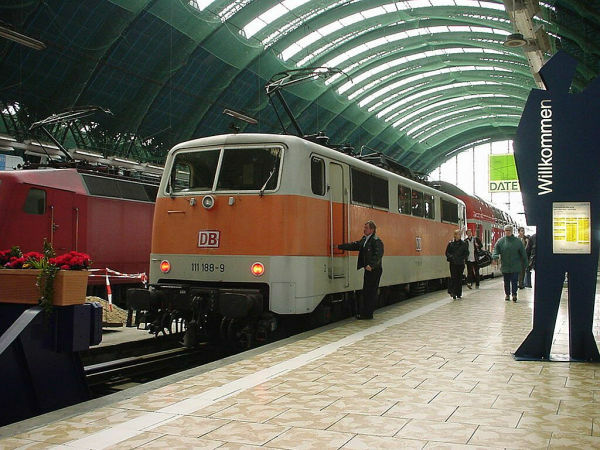 Here the train is being pulled into Berlin Ostbahnhof by a diesel shunter locomotive, a former East German V100 now owned by the company BUG, BUG Vermietungsgesellschaft mbH, a locomotive leasing company. Photo from near the Berlin Ostbahnhof station at 25.6.2018 by Risto Vormala. For a really long time the class 103, former E03, was the fastest, best and most beautiful of the German express train locomotives. 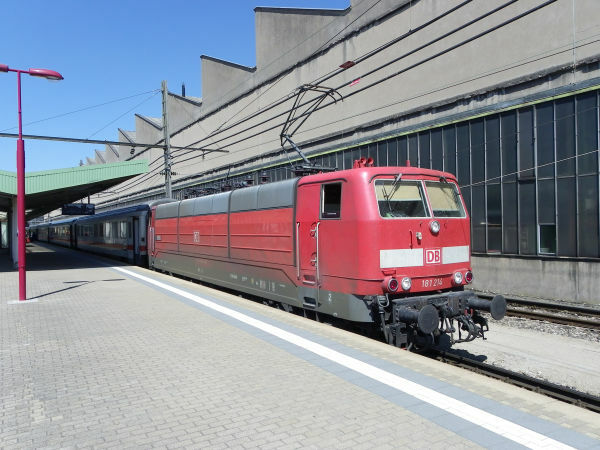 This one of them, no 103 113 was one of the last in regular passenger traffic, and in daily use in München to Ulm InterCity service until late autumn 2016 when it suffered a major engine failure. 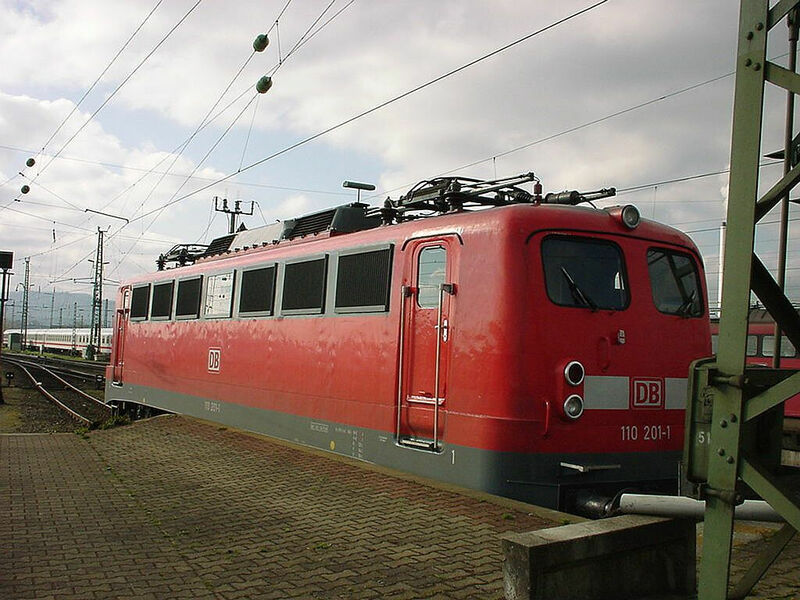 The loco has since been preserved by DB Museum in Koblenz. Here it has just arrived at Ulm 3.9.2016. Picture by Ilkka Siissalo. Another picture of the class 103 no. 113 in Ulm 3.9.2016 in its classic wine red and creme painting which these machines used to have when they were new. Picture by Ilkka Siissalo. Only one Br 103 locomotive ever got painted in DB's newest "Verkehrsrot" red livery. This is the one, 103 233. The model railroad company Roco paid for its special painting and then Roco published a small limited (and terribly expensive) series of H0 scale models of it. Actually that livery suits the locomotive's design quite nicely, or what do you think? Picture from Frankfurt Hbf 25.3.2002 by Ilkka Siissalo. For a while DB had a subsidiary called DB Bahntouristik for tourist trains from Germany over the Alps to the Mediterranean area. For that purpose one full train set and the locomotive of class 103 no.220 got a fairly odd painting scheme, with a light blue sky with clouds, green and yellow in the middle and dark blue at the bottom. Original file text: A machine with a very special painting is the 103 220-0 from the German railway DB. Between Osnabrück and Münster this Intercity has passed the village Kattenvenne. Photo taken at June 6th, 1996 by H.Pohlmann (from the University of Münster). Before the long era of the Br 103, pictured above, being the most prestigeous German locomotive, there was the E10, later Br 110, even later Br 115. This locomotive type was built as part of the 1950s "Universallokomotiven" program and it shared many parts with for example Br 140, Br 141 and Br 150 which were part of this family. Initially it was known as E10 and it was the locomotive for all the fastest, best trains of the country. E10 existed in two variants. The original variant, "Kasten-E10" had a flat face, whereas the bit later constructed "Bügelfalten-E10" had a slight bend in the middle of its front and it looked slightly more modern and aerodynamic. Here we see one of the once famous "Bügelfalten-E10", here as Br 110 and no more dark blue as they used to be in their heyday times, but in the now regular "Verkehrsrot" red paintings and now hauling a very old rake of formerly famous 1960s "Silberling" coaches, which are no more silver grey like they used to be, but in the 1980s "minttürkis" paintings. That's what the elderly often get to do: haul the less heavy ones as long as you can. Picture from Frankfurt Hauptbahnhof 25.3.2002 by Ilkka Siissalo. 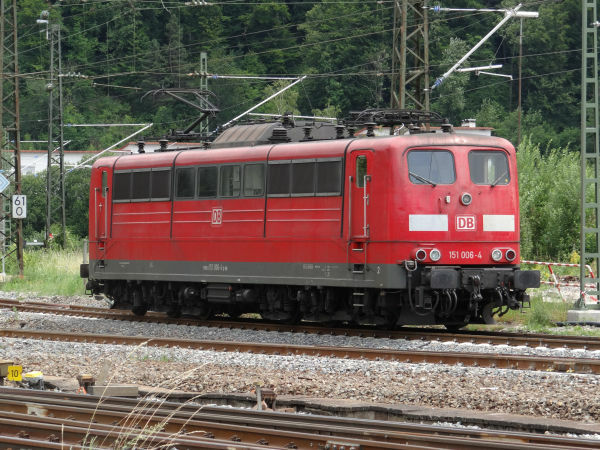 This is the "Kasten-E10", same locomotive as above, but with the original totally flat face. Picture from Basel Badische Bahnhof in Switzerland 25.3.2002 by Ilkka Siissalo. DB class 111 is from the 1970s. It was originally used in both express and regional trains, but nowadays you can see it with few exceptions in front of regional trains only, most often with doubledecker coaches. Picture from Münster Hauptbahnhof 8.10.2016 by Ilkka Siissalo. 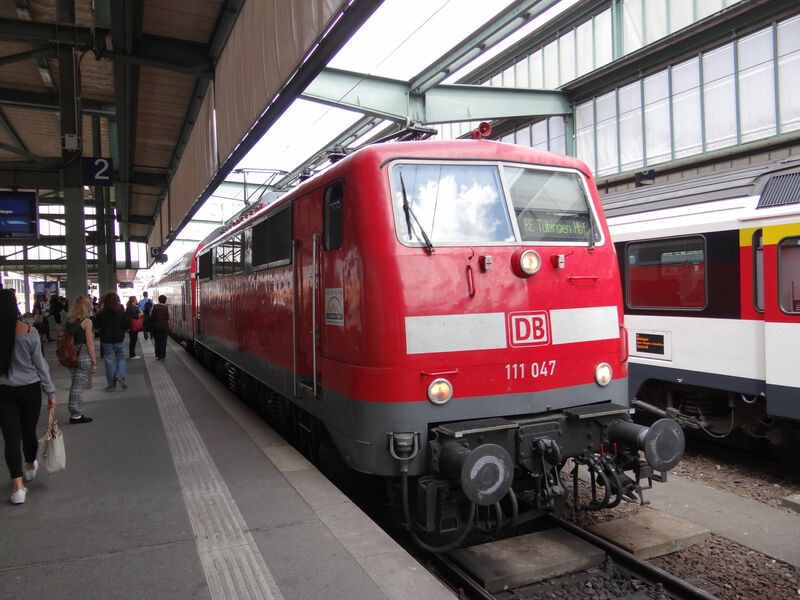 Another class 111 locomotive, here ready to pull a doubledecker service out of Stuttgart. Picture at Stuttgart Hauptbahnhof 8.7.2015 by Ilkka Siissalo. Most of the Br 111 locomotives were delivered in this "Türkis" livery, which was first taken in use in the 1970s. Many of the locomotives, just like this one, carried these colours until the end of the 1990s or even well into the 2000s. The coaches which can barely be seen behind the locomotive are of the type "Modus". They were modernised or even totally rebuilt communist time DDR East German Halberstädter coaches, out of which only the underparts were used, and which had totally new and modern chassises. As of 2019 even of these rebuilt Modus coaches none are left. Even though the upperparts were modern, the undercarriages were still of the old communist time DDR style and were not satisfactory. Presently the remaining Modus coaches are in Gabon in Africa. Some of the Br 111 locomotives were used in the Düsseldorf area S-Bahn traffic and got there the grey and orange S-Bahn livery which was first created in the 1980s. Here is still one of those locomotives carrying the old orange livery, although here already in new services in Frankfurt. This is the class 112. 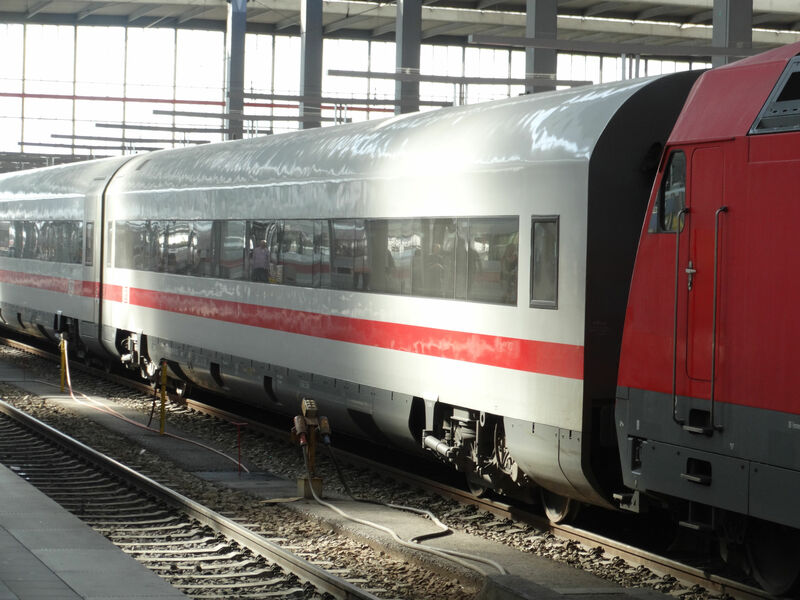 It was known as class 212 by the East German Railways DR, even though only a prototype was produced before the German reunification. It is the faster variant of the much more common class 143 pictured below, intended for fast express trains. It looks almost identical to the Br 143, except for the front lamps. Picture from Potsdam station 21.7.2007 by Ilkka Siissalo. Another view of a class Br112 locomotive, here in front of a regional express train. 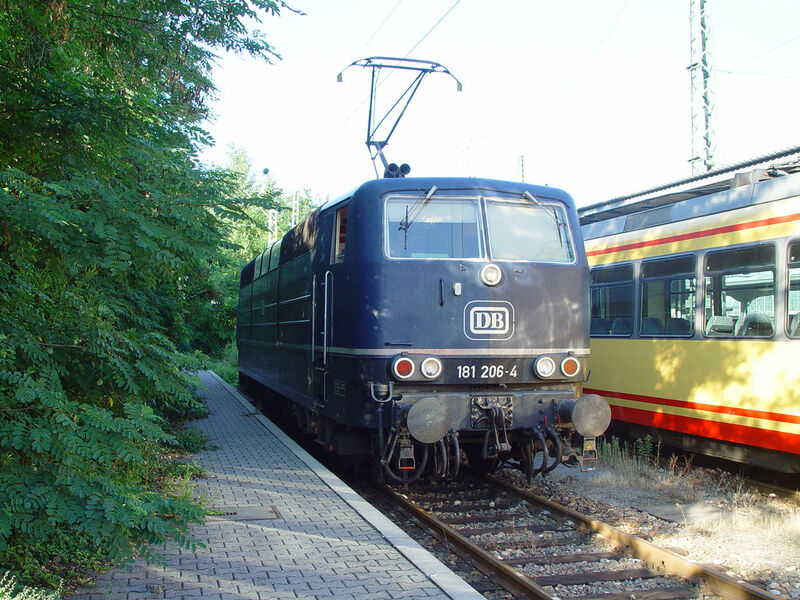 A Br 112 locomotive in front of an InterRegio train just about to leave towards Stralsund. The Br 112 looks almost the same as the Br 143 pictured below, but 112 is the faster express train variant. At a quick glance the lamps are the first difference which is easy to spot. This is the DB class 120. It was Germany's first really modern high-speed express train locomotive. It looks still quite modern, although the design is already from the 1970s. They were built in two series 1979-1989, in total 65 of them, by a consortium of the companies BBC, Henschel, Krauss-Maffei and Krupp. It works only on 15 kV AC. Top speed is 200 km/h. This one is from the second series built 1987-89. Picture at Karlsruhe Hauptbahnhof 8.7.2015 by Ilkka Siissalo. Another class 120 locomotive, this time the no. 104. It looks like it definitely would need a new painting. Picture at Karlsruhe Hauptbahnhof 8.7.2015 by Ilkka Siissalo. 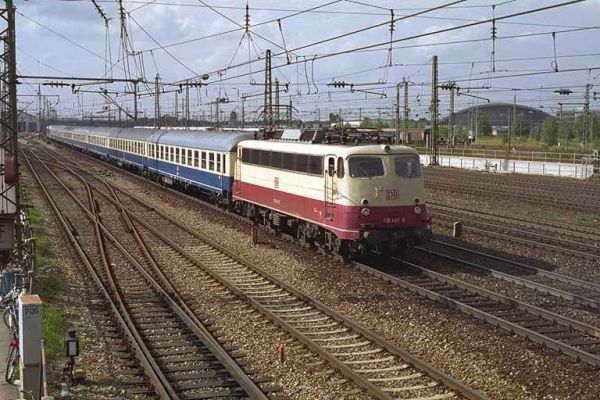 Another class 120 locomotive, but in the older so called Orientrot livery and in front of a blue and white rake of InterRegio train coaches. The train class InterRegio or IR does not exist any more. Picture from Frankfurt Haupbahnhof 25.3.2002 by Ilkka Siissalo. Baureihe 143, earlier 243 of the DR of ex-DDR, was the last one of communist East Germany's locomotives that was built in bigger numbers. It was in many ways superior to most electric locomotives that western DB was using at the time of the reunification of the German states. 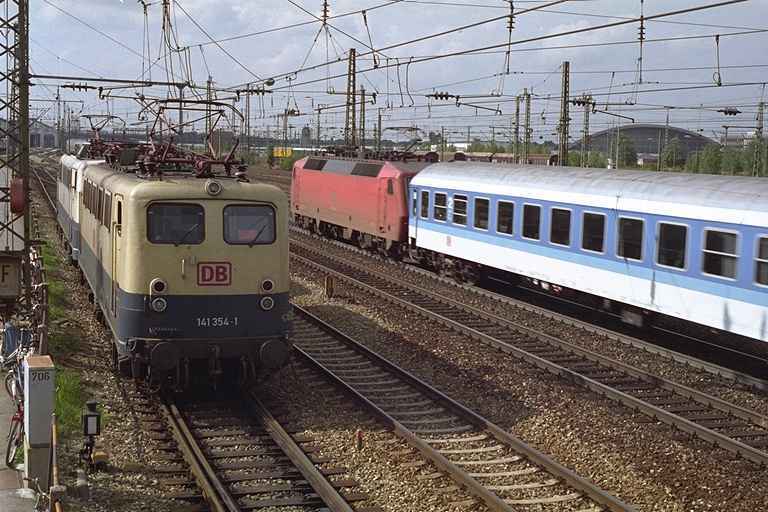 Beginning in 1990, the eastern DR leased a large number of these to DB, and after the reunification the production in Hennigsdorf in former East Germany was continued for both DR and DB as a somewhat upgraded and faster variant, now known as classes 112 and 114. 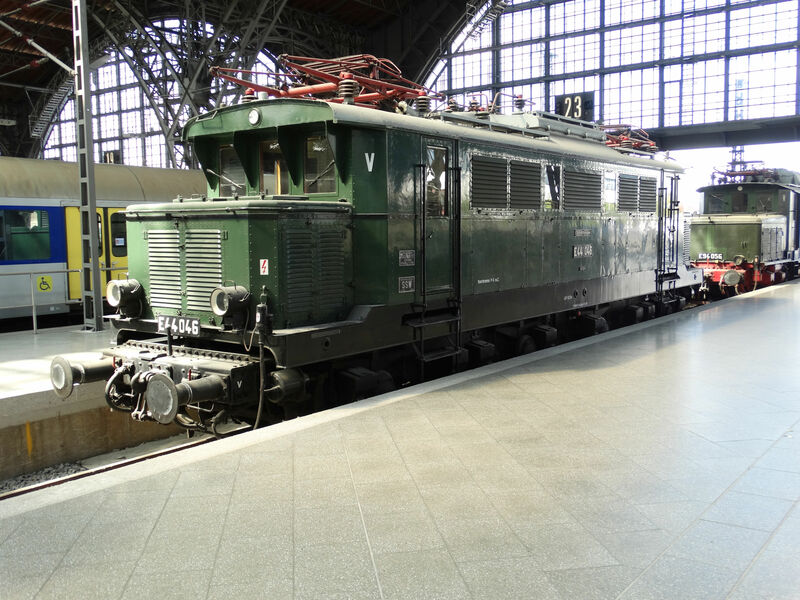 There were political motives as well, but in the west a large share of the existing locomotives were still from the "Einheitslokomotiven" group of locomotives from the 1950s, and these machines were a welcome and much needed refreshment to DB's rolling stock. They have been used especially in regional traffic and they very quickly pushed aside for example the 1950s class Br 141. 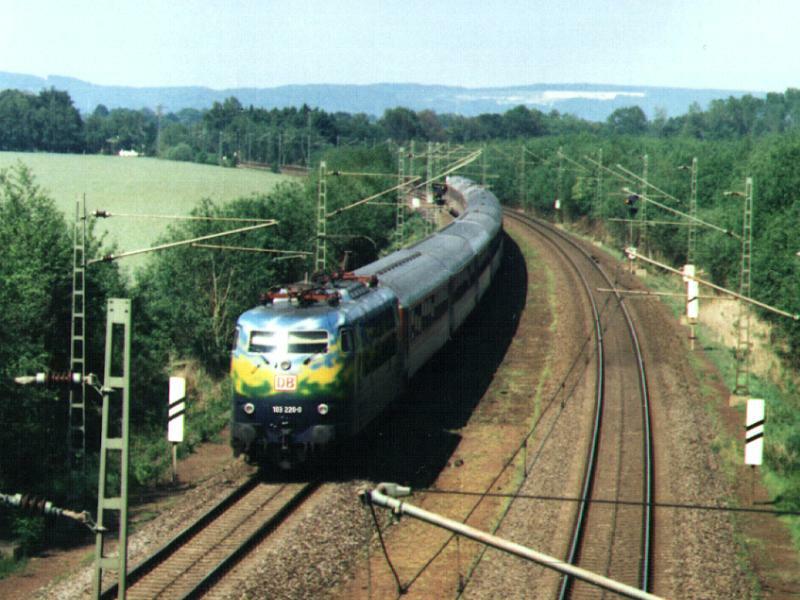 In the first years of this millennium, DB planned to upgrade a big number of 143 locomotives to class 114 to allow the locomotives to replace class 111 on services where 160 km/h maximum speed was required. However, only two locomotives were converted and even these were never allowed to run faster than 120 km/h. This is the other end of the same train as the Br 143 locomotive above. This is a steering cab wagon known as the "Karlsruher Kopf" (head of Karlsruhe). The coaches are of the very famous n-Wagen or "Silberling" series from the 1960s and since the beginning of 1960s, there were steering cabs built in them for push-pull operation. The very first driving trailers were not satisfactory however, with too small spaces for the driver (They had the nickname of "Hasenkasten", rabbit cages) and they were quickly rebuilt with proper driving trailer cabs. The two main types of cabs are known by their places of origin, the cities of Karlsruhe and Wittenberg. The use of these Karlsruher steering cab coaches ended in December 2018. 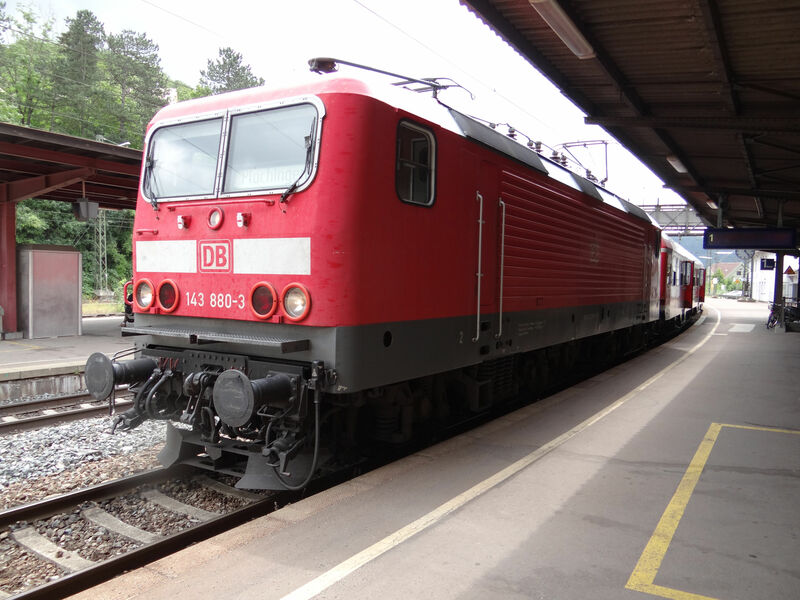 Photo at Geislingen (Steige) station 8.7.2015 by Ilkka Siissalo. The ex-DDR class 143 has been a permanent part of regional passenger traffic of the Ruhr region of western Germany since 1990 when the first locomotives were leased there from DR of East Germany. 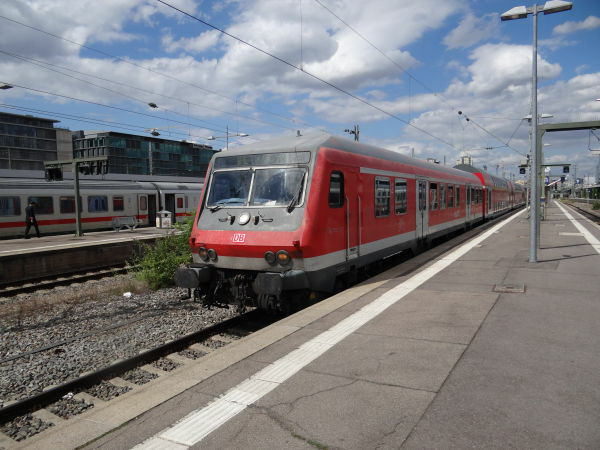 They have been used with S-Bahn local commuter train coaches of the so called x-Wagen class since the beginning of the 1990s. In recent years they have been gradually pushed out of service, especially by the newer EMUs of the class 422. Service in Ruhr region with x-Wagen will end in December 2019. Picture from the Düsseldorf Hauptbahnhof 7.5.2009 by Sanna Siissalo. This is the original livery of the Br 143 locomotives. 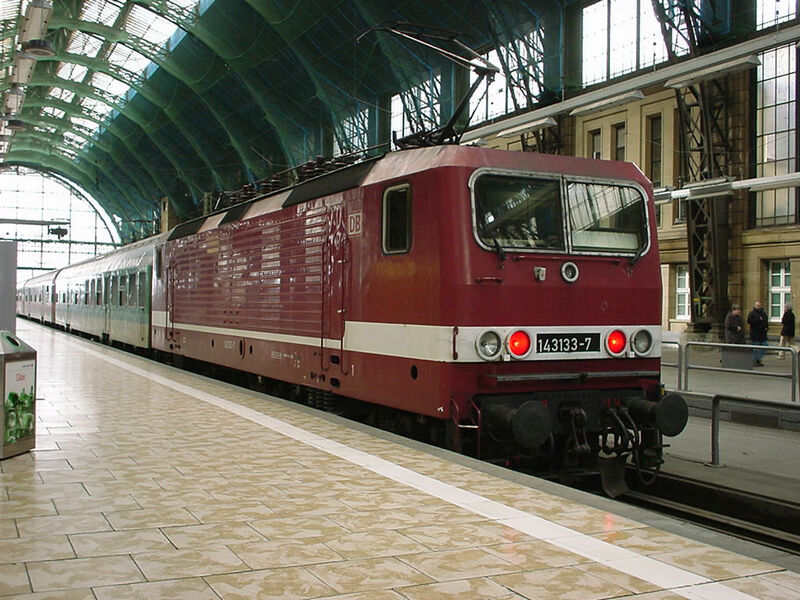 This wine red scheme is the one that was used by the communist DDR's DR when these locomotives were still called Br 243. This one has gotten new DB stickers and its number at the front has been haphazardly changed to the western Br 143, but other than that, it still is in its original style. Quite nice looking actually. 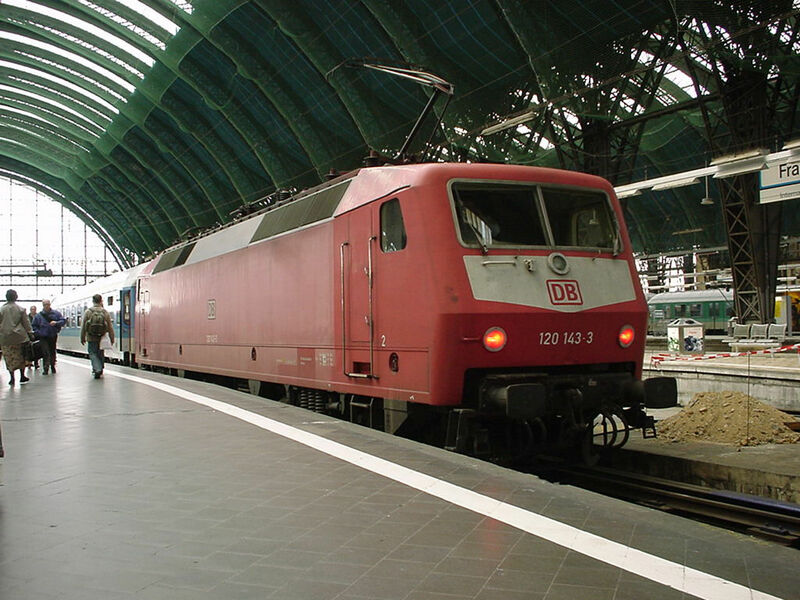 The DB class 145 is the very first generation of what later became known as the TRAXX family of locomotives built by Bombardier. 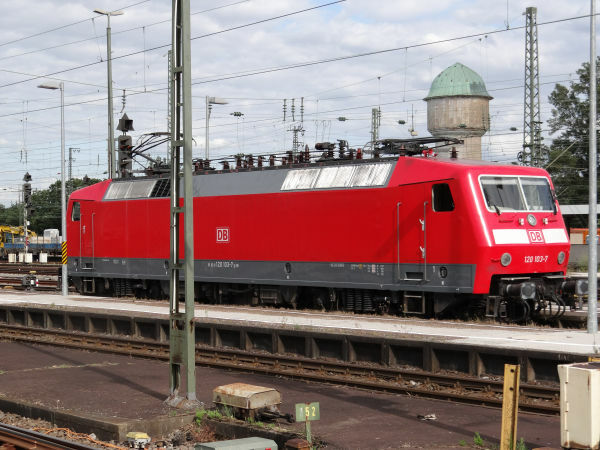 At the time when these were new, they were intended to be slightly weaker, but markedly cheaper basic cargo locomotives than the key competitor Siemens' class 152 locomotives. Br 145 soon became a massive commercial success and TRAXX locomotives continue to be sold even today in large numbers in many countries. In year 2000 a trial was made to see if the class 145 would be good for passenger traffic as well. Some 145s got a display in their windscreens to show where the train is going and the necessary automation for opening and shutting passenger coach doors. This one is one of those individuals - that is easy to see from the display panel at the front window with the text "Sonderfahrt". (No, it's not going to a place called Sonderfahrt. Sonderfahrt means special service.) The trial was a success and led later to the creation of class Br 146, the TRAXX passenger train variant. Picture at Erpel by the Rhein river 8.7.2010 by Ilkka Siissalo. 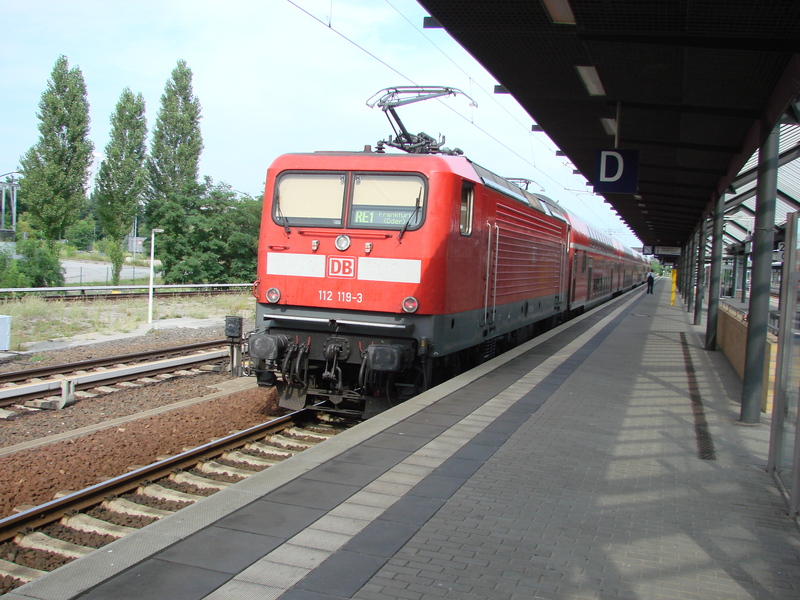 DB class 146 is the passenger train variant of Bombardier's TRAXX family of locomotives. This one is of the subclass 146.500 intended for faster InterCity train use and painted white according to the new IC2 train colouring scheme. 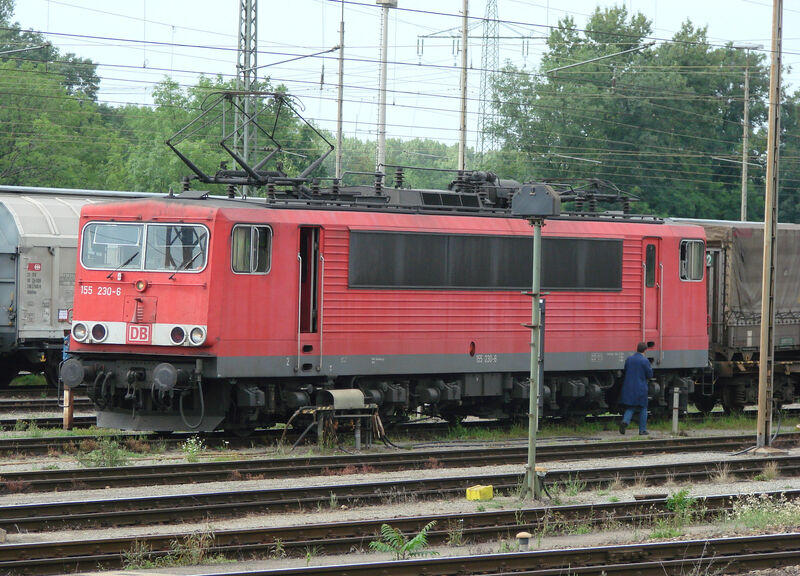 The initial "basic" TRAXX was the class 145, a simple, but cheap cargo locomotive. Some of those were tried in passenger traffic and found out to be suitable. Out of that developed the class 146 for passenger trains. 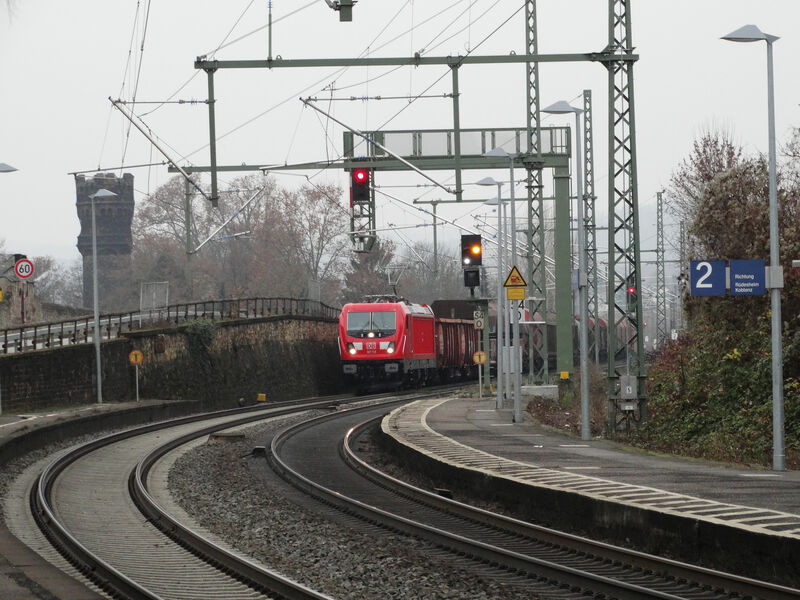 The most notable outer difference between the cargo variant 145 and the passenger train variant 146 is the LED panel at the windscreen showing the train's end station in the class 146 locomotives. 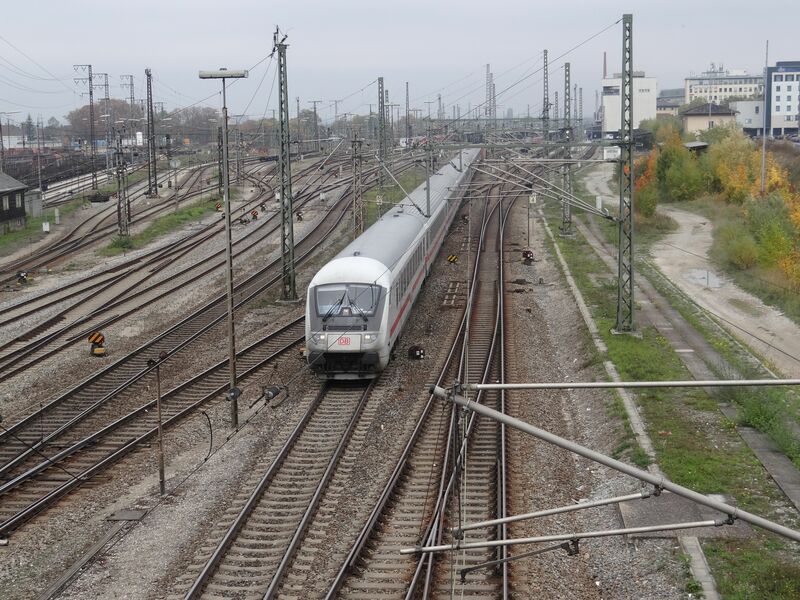 Picture at Münster Hauptbahnhof 8.10.2016 by Ilkka Siissalo. This is the second generation TRAXX passenger train locomotive of the Br 146.2xx class. It is almost identical with the machine shown above, but used with regional trains. Picture at Geislingen (Steige) station 8.7.2015 by Ilkka Siissalo. This locomotive is of the class 146.1xx. It is a first generation Bombardier TRAXX passenger train variant. One has to look at the front really close to notice a difference with the later 146.2xx and 146.5xx locomotives, but the shape is slightly different. Photo from Weil am Rhein station 17.7.2007 by Ilkka Siissalo. This is the 4th generation of Bombardier double decker steering cab wagons. These one can often see at the other end of trains with locomotives just like the one above. Picture at Geislingen (Steige) station 8.7.2015 by Ilkka Siissalo. 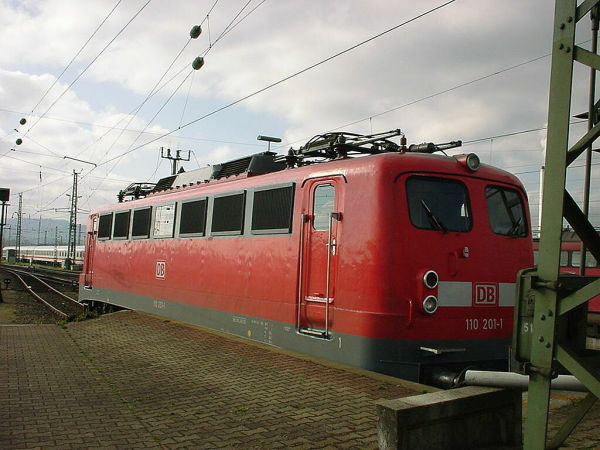 This is the 3rd generation of Bombardier double decker steering wagons, type DABpbzfa, which quite a lot resembles the "Wittenberger" steering cab wagons of older n-Wagen or Silberling coach trains (see above), but is just a double decker. This also is a fairly common sight with push-pull trains in southern Germany with DB locomotives of the type Br 146 or Br 111. Photo at Nürtingen station 8.7.2015 by Ilkka Siissalo. 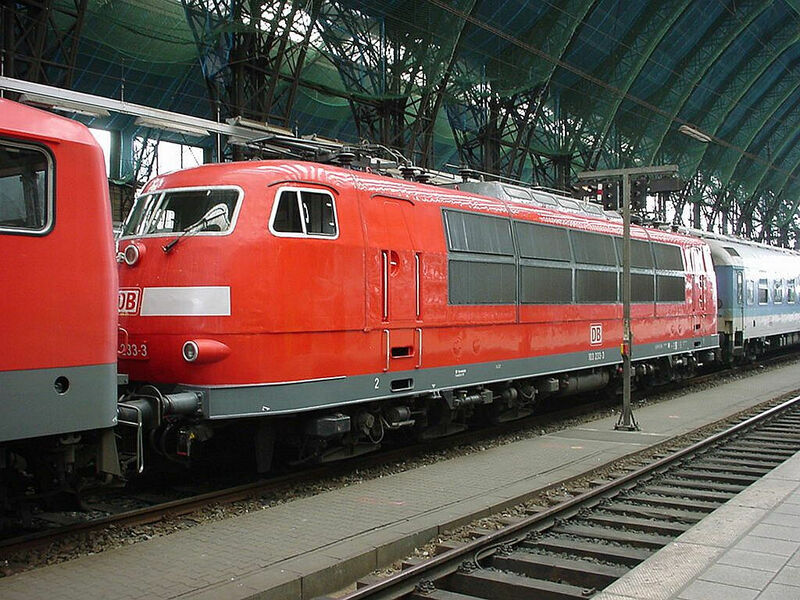 In the 1950s emerged a series of West German locomotives by the name of Einheitslokomotiven, unified locomotives. They all look pretty much the same. Br 140 was the cargo variant, Br 141 regional passenger train variant, Br 110 express train variant, Br 112 (reclassed as Br 113 after German reunification) fast express train variant for services with 160 km/h, Br 139 the variant with an electric brake for mountainous routes and Br 150 the six axle heavy cargo variant. In 2005 the Br 115 emerged as well, this was the same as Br 110 but dedicated for night and long distance trains when majority of Br 110 had been moved to regional services. This machine in the picture is a Br 151, which is a further development of Br 150 and which was intended to replace it. It was built not in the fifties, but in 1972-78, but still with the same basic design. It is a six axle heavy cargo locomotive delivered in 170 copies. It produces 6288 kW of power. 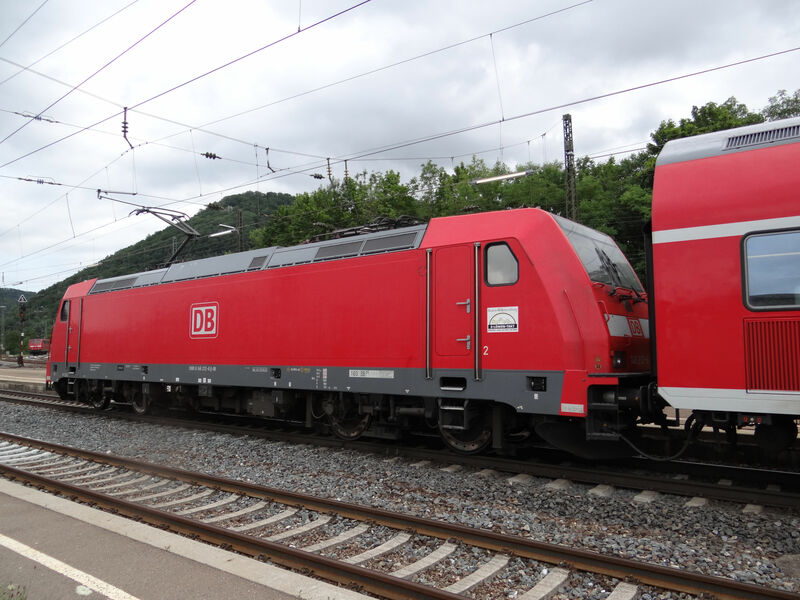 Some have been scrapped, a great majority have been sold, but locomotives that are leased back from Railpool leasing company still run on DB Cargo services as of 2019. Here we see one Br 151 waiting at Geislingen. 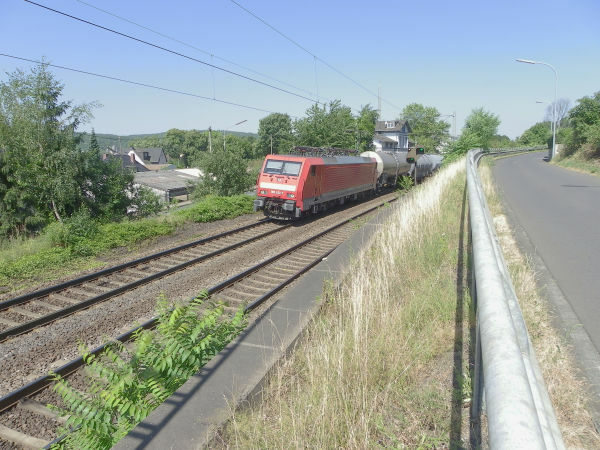 There is a really steep uphill slope called Geislinger Steige and some of the more heavy trains need another extra locomotive at the end to push them uphill. Therefore always one or two Br 151 machines are kept there waiting on duty. Photo from Geislingen 8.7.2015 by Ilkka Siissalo. 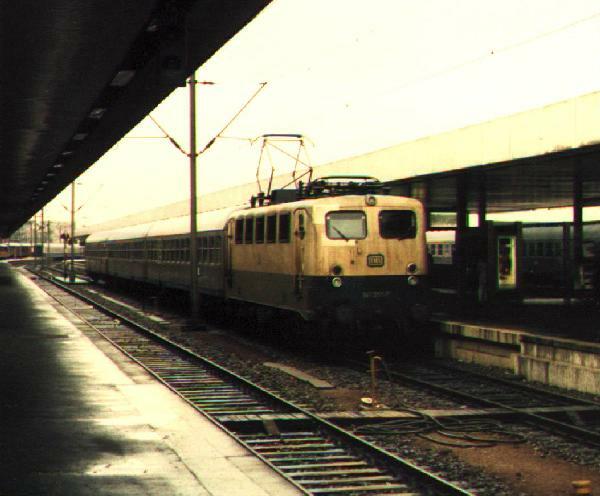 This is how the class 151 machines looked like in the 1970s. A Br 151 in the blue and creme seventies painting scheme and a class 140 four axle Einheitslokomotive in the so called oriental red painting scheme of the 1980s. 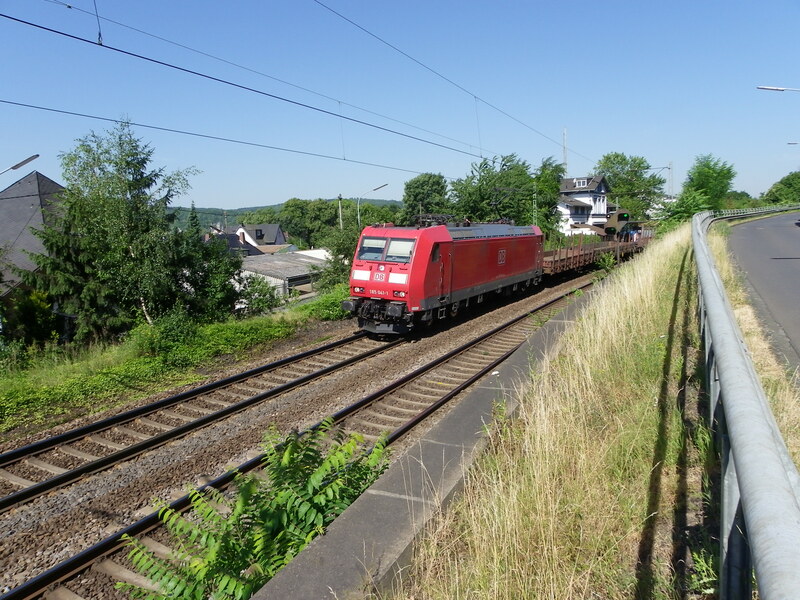 A heavy freight train is passing the station of the German town Lengerich. The 151 137-7 has the classic blue/beige painting. 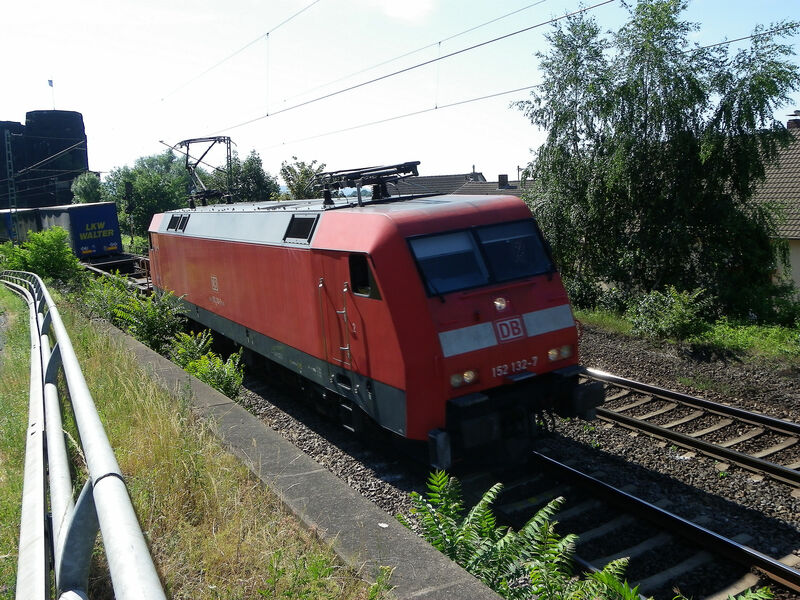 The second loco of the type 140 is in the "Orientrot" red outfit. Photo taken at June 6th, 1996 by H.Pohlmann. This is a cargo locomotive of the DB class 152. It looks like a Bombardier TRAXX, but it is not. 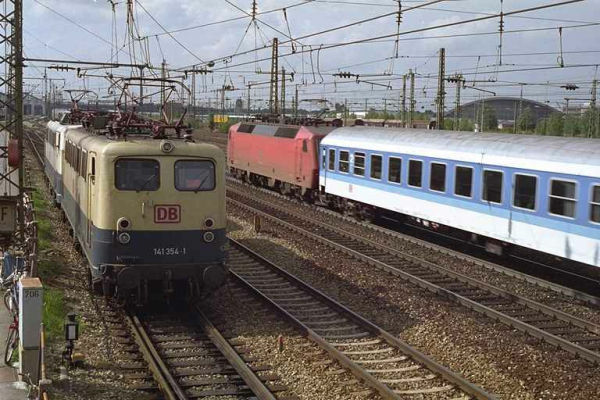 This is an older type still from those times when Siemens and Adtranz, later Bombardier, still worked together as a consortium and the model is derived from Siemens' so called EuroSprinter platform. Bombardier later made a similar, but simplified and cheaper competing model, the Br 145, which later became the forefather of the TRAXX family. The weakness of Br 152 was that it never got a permission to run in Austria as it was deemed too desastrous for rails in Austria's curvy tracks. Nevertheless it was DB's first truly modern electric cargo locomotive in the 1990s. Picture by Erpel by the river Rhein 8.7.2010 by Ilkka Siissalo. The Br 155 is a design from the communist ex-DDR. Western DB has nothing similar. It is a six axle powerful cargo locomotive. 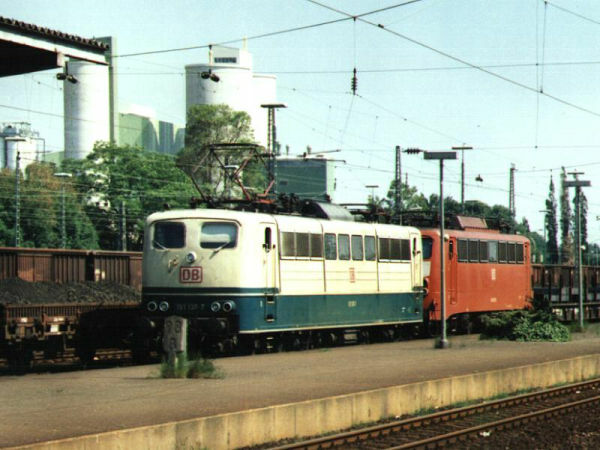 In DDR it was called class 250, but it was renamed to 155 after the reunification of the two states. A total of 273 of them were built by LEW Hennigsdorf 1974-1984. They were designed as universal locomotives for both cargo and passenger traffic, but later all were assigned to the cargo part of DB. It has a power rating of 5200 kW and a top speed of 125 km/h. Its nickname is Kraftkontainer, energy container. Picture from Weil am Rhein 17.7.2007 by Ilkka Siissalo. The Stuttgart - Zürich EC trains were the last ones to use the classic 1950s/1960s locomotives in regular, prime EuroCity services. This is a Br 115, former Br 110, still former E10, which was one of the 1950s "Einheitslokomotiven". 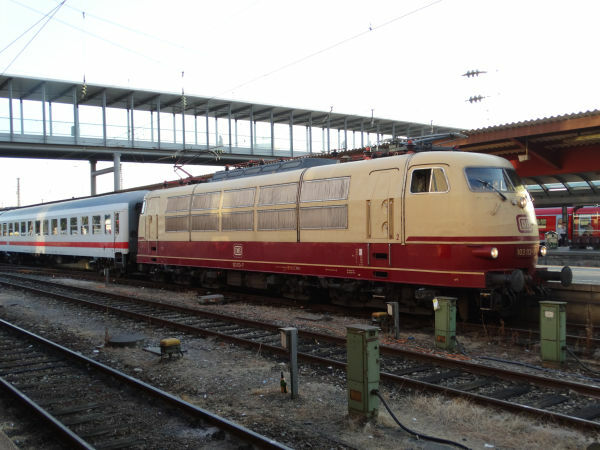 The class E 10 / Br 110 existed in two versions, one with the flat "face" as typical of all the Einheitslokomotiven, but one also - this one - with a slightly modified, a bit more aerodynamic "face". The nickname of these was Bügelfalten-E10, a notion to a laundry ironing iron. These used to be the top of the top, finest of the fine, anno Domini around 1962 or so. Here one of them is still alive and moving and about to haul an international EuroCity with Swiss SBB coaches towards Switzerland. Just like in the 1960s. But you wouldn't expect this anymore in 2015. Regular use of these locomotives on this line ended in December of the same year. One year later it would already have been a "Wow" to see one of these moving, let alone at the front of a prestigious cross border EuroCity. Feel the waves of history... :-) As of 2019, only two locomotives are still active with DB, but their future is extremely uncertain. 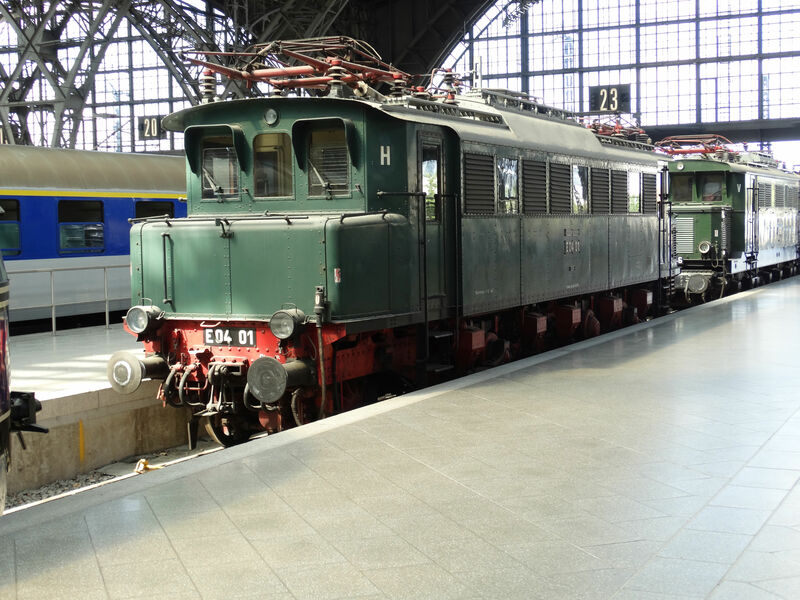 Two of the class 115, former type E10 / Br 110 locomotives at München Ostbahnhof. The one in the front is the E10 variant with the flat face. The one in the back is one of the Bügelfalten-E10, "ironing iron" models. The difference is very slight, but if you look really closely at the locomotive at the back, it has a small extra window between the driver's door and the windscreen. Compare also with the picture above. Picture at München Ostbahnhof 29.4.2006 by Ilkka Siissalo. This is how the West German class 112 / E10.12 locomotives used to look like. The locomotive here is in the classic Trans-Europ-Express wine red and creme painting just like in the early 1960s and the coaches are in the 1970s blue and creme scheme. 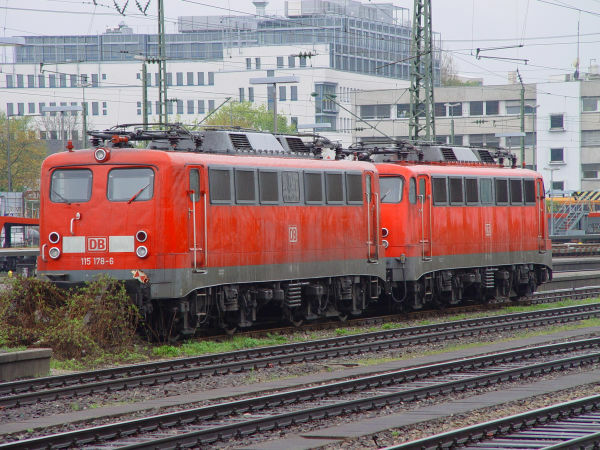 A majority of these locomotives had trouble with their bogies since the mid-1980s, resulting in a reclassification as class 114 with reduced speed (not to be confused with present day class 114, a near relative to class 112 of unified Germany, and of East German origin). As the speed reduction did not help, DB equipped the troubled locos with recycled class 110 bogies, and consequently all 20 locos of class 114 (previously West German 112) were integrated into class 110. Class 110 no. 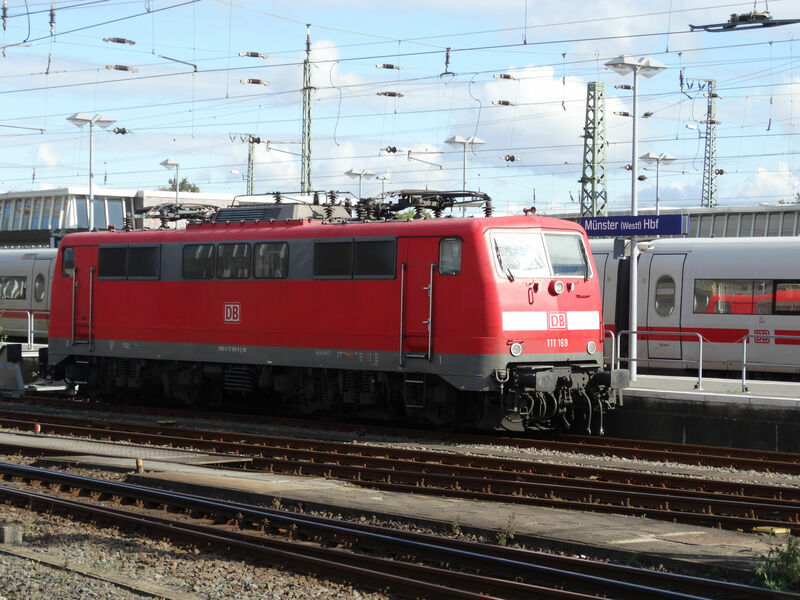 485 (formerly 114 485 and originally 112 485) arriving at München with a football special 23. September 1995. Photo by Erik Hjelme. The class 141 was the regional passenger train variant of the 1950s Einheitslokomotiven family. Here seen in the 1970s blue and creme colours, but already with the new DB AG logo. In the background a class 120 express train locomotive in the oriental red painting scheme and with blue and white InterRegio coaches. Original quote of the picture: 141 354-1 coming out of the depot in München. An unidentified 120 leaving with an InterRegio in the rear. 23 September 1995. Photo by Erik Hjelme. This picture could have been from the 1970s, but it is quite not. It is a class 141 Einheitslokomotive with "Silberling" coaches still in their metal colours like they were when they were new. 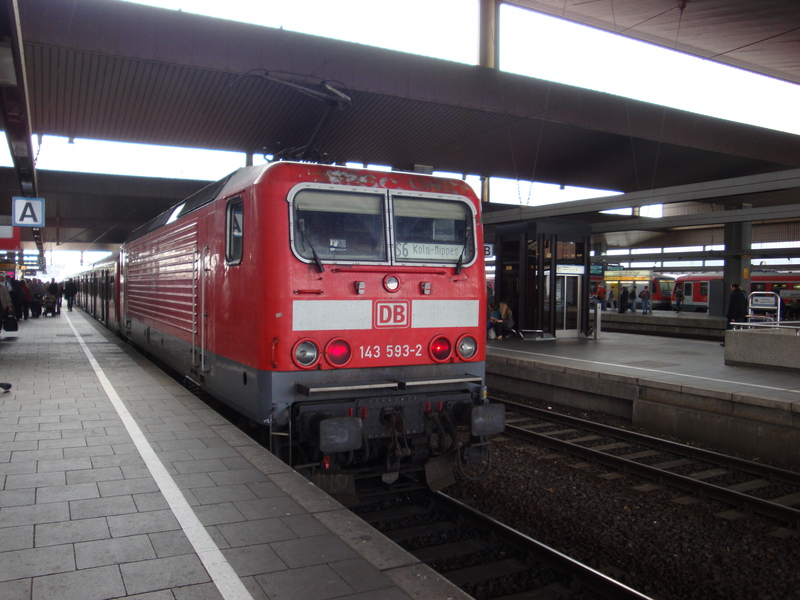 This was a short haul regional service ready to leave from the station of Hannover. Sorry for the poor quality of the picture, but the photo was taken with a small film camera, printed on paper and then scanned with a hand scanner. Picture at Hannover Hauptbahnhof 19.8.1996 by Ilkka Siissalo. The class 181 (originally E 310) and a very similar class 184 (E 410) were an early attempt to create a locomotive that would be able to cross borders and operate on multiple electric systems. 181 was a dual system locomotive for operation in Germany, Austria, France and Luxembourg and the 184 was an attempt at a four system variant. The four system project was quickly abandoned, and class 184 operated for the greatest part of its career until 2001 capable for two systems only. Technology was not ripe enough. 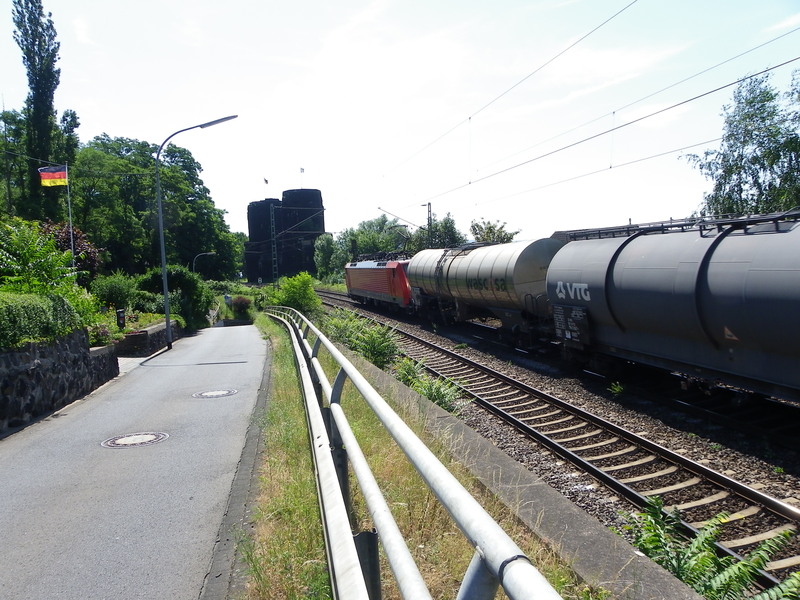 But Br 181 was used a long time, especially in traffic from Germany to Luxembourg. Services to Luxembourg ended in 2014, and the last locos were taken out of service in December 2018. The first ones of these were built since 1966 and these serial locomotives of the class Br 181.2xx are from 1974-75. 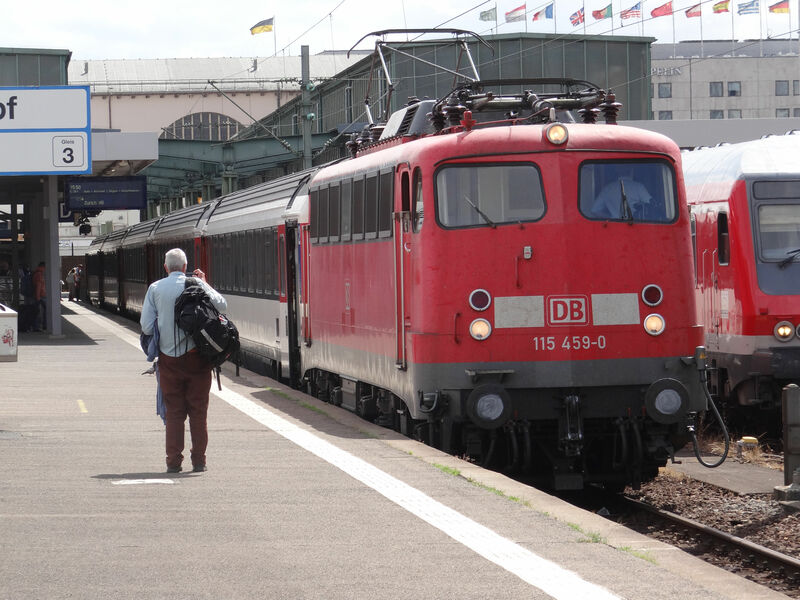 Here a Br 181.2xx locomotive is waiting at the Luxembourg main station with a German InterCity train to Frankfurt. 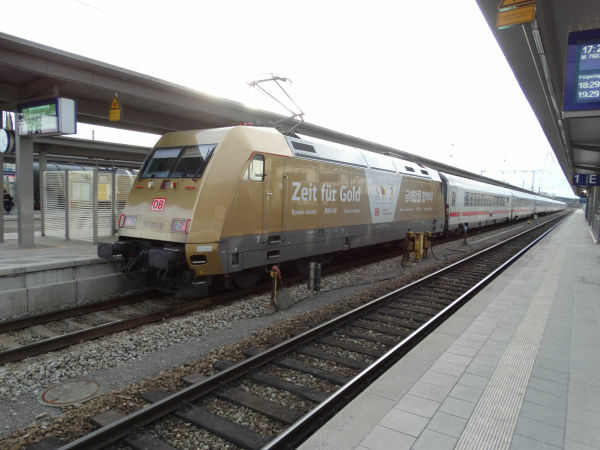 This all is history by now and there are no longer loco hauled IC trains between LUX and DE, but just regional express trains and one daily InterCity service operated by a Stadler KISS EMU from Luxembourg. Picture from Luxembourg main station 19.7.2010 by Ilkka Siissalo. When the first class 181 locomotives were new in 1974-75, they were painted cobolt blue. Three locomotives were deliberately kept in the original livery. This is one of them, owned by the DB Museum in Koblenz-Lützel. Picture in Karlsruhe 20.7.2004 by Ilkka Siissalo. 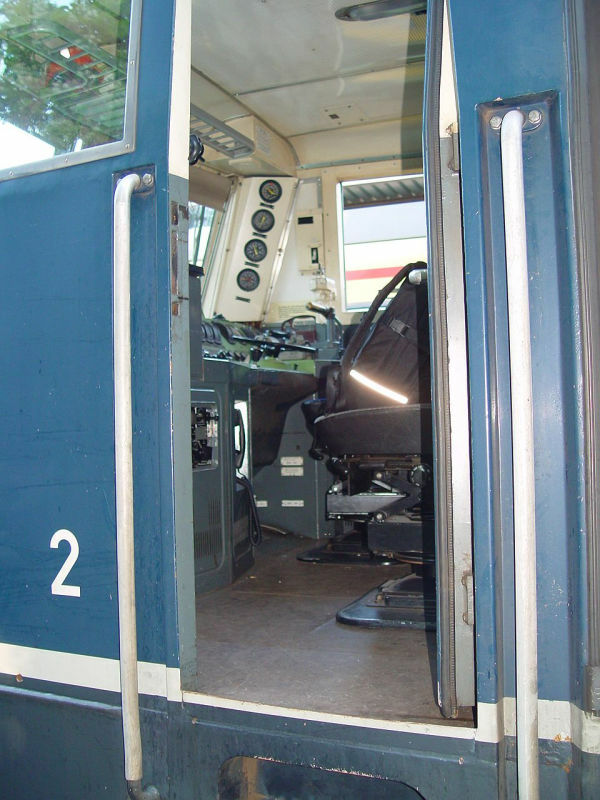 A sneak peek into the driver's cab of the Br 181 no.206. It is 1970s technology, but it looks fairly modern. Picture in Karlsruhe 20.7.2004 by Ilkka Siissalo. Two of the Br 181.2xx locomotives. Note that these machines have windows instead of air fan grilles at the centres of their sides. Compare with the picture of 181 214 taken in Luxembourg, shown above. Picture in Karlsruhe 20.7.2004 by Ilkka Siissalo. 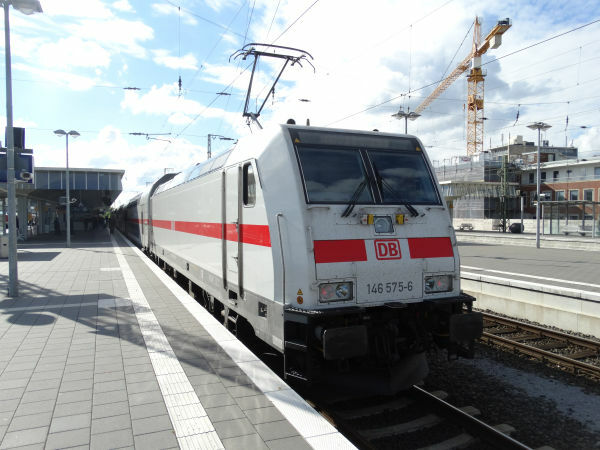 Class 185 is the multiple electric systems capable cargo version of the Bombardier TRAXX family of locomotives and this is one of the very first Br 185 TRAXXes of DB, class 185.0xx. At later models one can see up to four pantographs and a lot more equipment on the roof. Picture at Erpel 8.7.2010 by Ilkka Siissalo. Two TRAXXes are meeting. 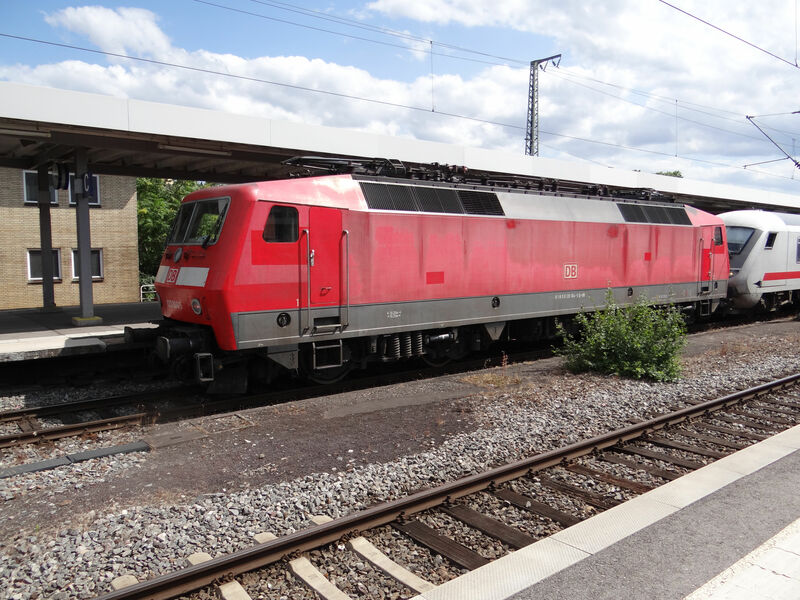 The one on the top is a Railion (DB Cargo) TRAXX of Br 185.3xx which can run all the way up to Sweden. 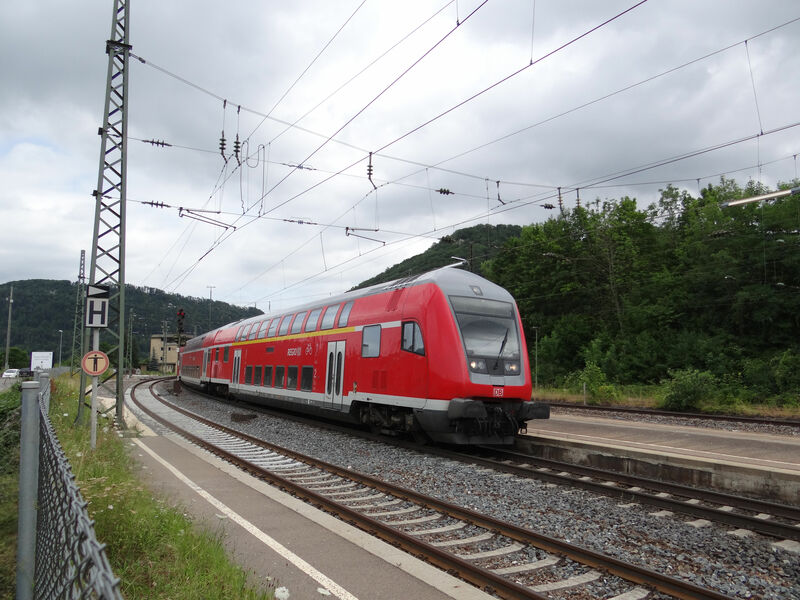 The blue and red is a Swiss SBB Re482 of the TRAXX family, which can run on the DC current in Holland or Belgium, on the 25kV AC on modern Holland to Germany lines as well as on the 15kV AC common in Germany and Switzerland. Click on the picture to see it in full scale and compare the structures on the roofs. 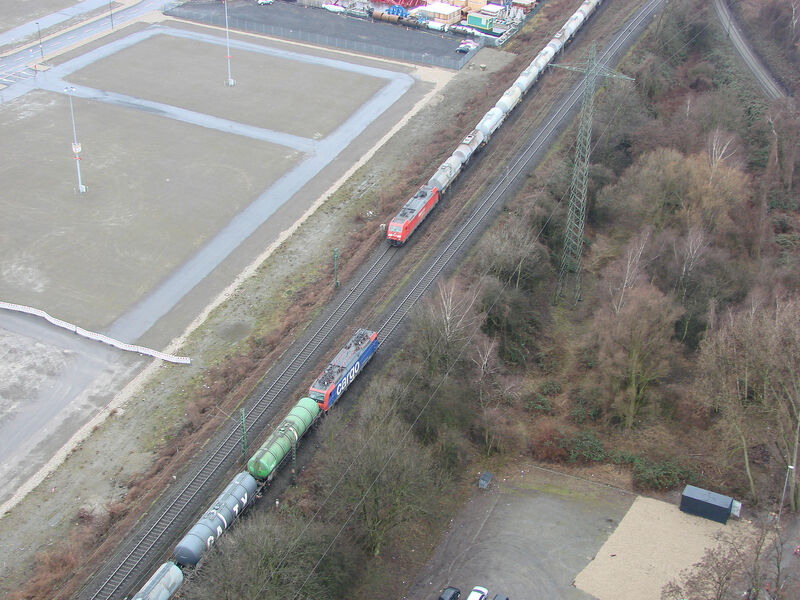 Picture from the top of a huge gas container at Oberhausen 27.2.2010 by Ilkka Siissalo. 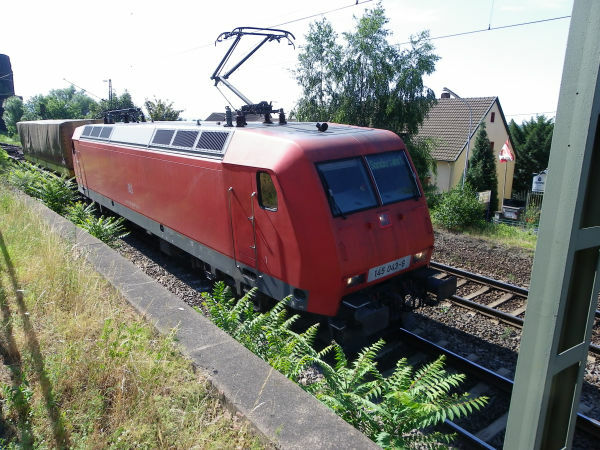 The same Railion TRAXX Br185.3xx as in the picture above, but seen from closer by. Picture from the top of a huge gas container at Oberhausen 27.2.2010 by Ilkka Siissalo. 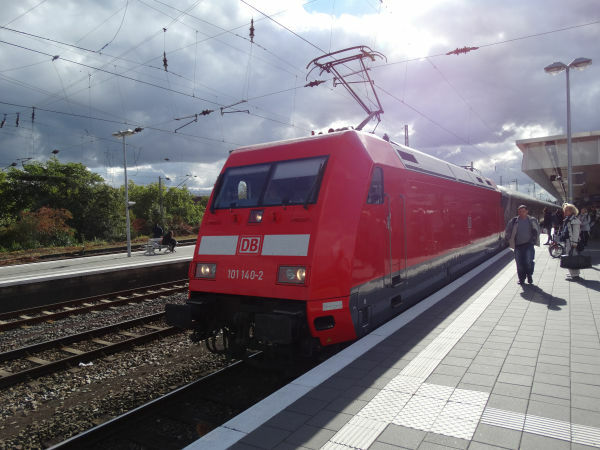 Baureihe 189 is the Siemens EuroSprinter locomotive family equivalent to the Bombardier TRAXX family's Br 185. The front looks very much like the older Br 152 - and also a lot like the competitor's TRAXXes. The sickled side walls distinguish this type from both the Br 152 as well as from the Bombardier TRAXX types. If you see the locomotive by the side, the axles of Bombardier's locomotives are also markedly in different positions from what the Siemens EuroSprinter family locomotives have. The EuroSprinters - like this one - have much longer bogies, so the second axle is way further towards the middle of the locomotive. 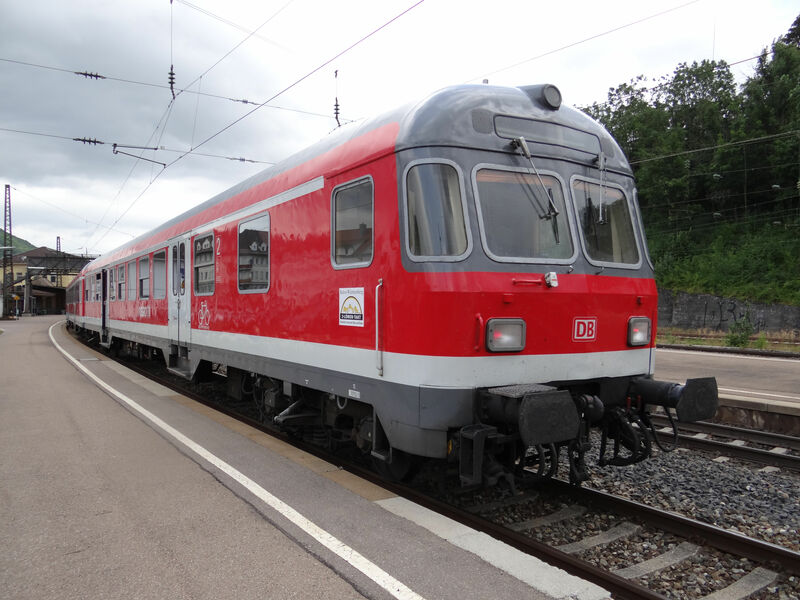 Like with the TRAXX Br 185s, also these Br 189s are multiple electric system machines and typically run not only with Swiss/German/Austrian AC 15 kV but also with 3 kV DC, 25 kV AC and other voltages such as 1,5 kV DC. They are often used in routes from Belgium or Holland east through Germany to Poland, Czech republic, Slovenia etc, sometimes all the way to Turkey. Picture at Erpel 8.7.2010 by Ilkka Siissalo. Compare with the TRAXX pictures above. Same train as in the picture above. From this side the sickled walls of these Siemens locomotives is evident. The towers in the front of the locomotive are remains of a famous railroad bridge, the Erpel bridge over the Rhein river. The bridge was destroyed towards the end of WWII as US troops invaded the area and it was never rebuilt. Picture at Erpel 8.7.2010 by Ilkka Siissalo. 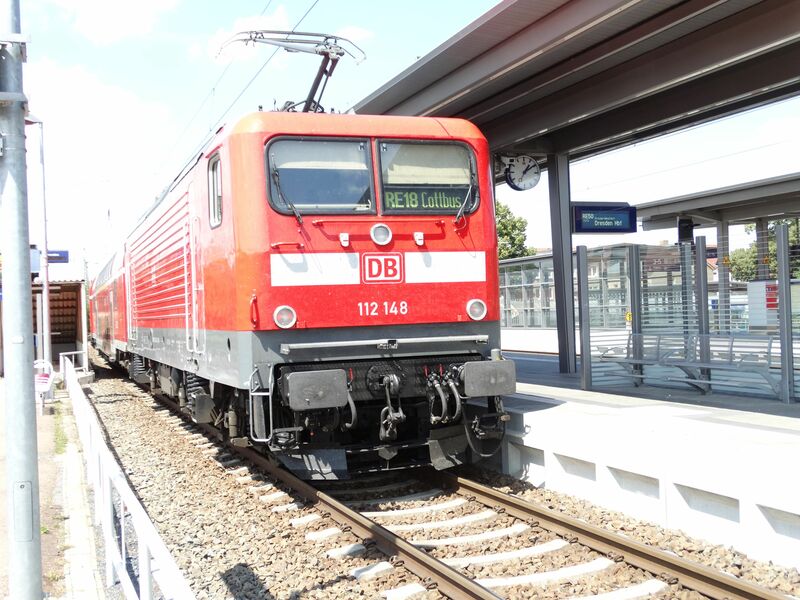 Baureihe 187 is Bombardier's 3rd generation TRAXX locomotive and at the end of 2016 the absolutely newest locomotive of DB. As is evident from the picture, its looks have improved somewhat compared with the older TRAXXes. This is a multiple electric system locomotive. It works both with 25 kV AC and 15 kV AC and it has also a small auxiliary diesel engine allowing it to shunting work even without electric catenary wires. It is capable of moving a 2000 tons weighing train at 40 km/h without electricity with this so called "last mile" diesel. Picture at Hattenheim station by the Rhein river 16.12.2016 by Ilkka Siissalo. A young guy is desperately trying to catch the leaving RE5 train to Elsterwerda. This is an old DDR designed 2nd generation double decker steering cab wagon, built in communist East Germany since 1988. 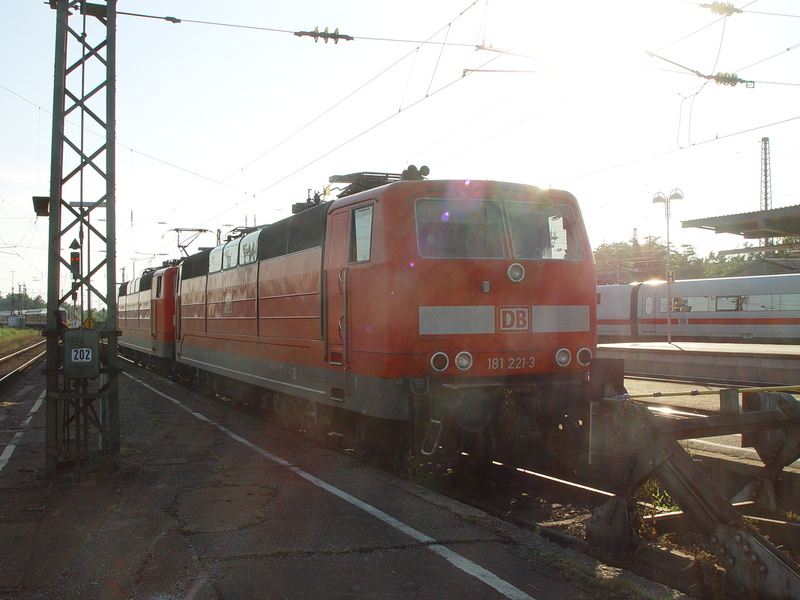 At the other end of the train was a pushing Br 143 locomotive, that also ex-DDR. Picture at Berlin Hauptbahnhof 4.3.2016 by Ilkka Siissalo. The electric locomotive type E04 is from the pre-war Nazi times. It was developed for express trains in 1932-36. 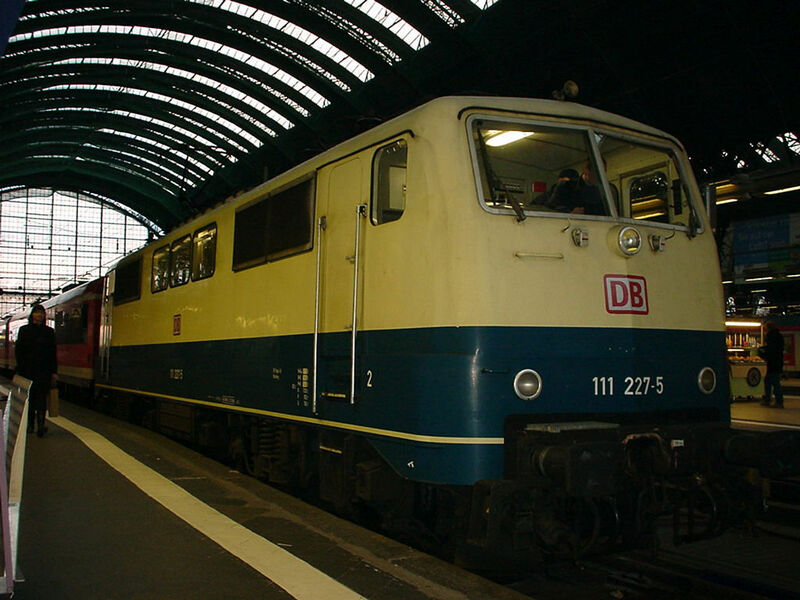 The type served as E04 during the pre-war DRG times, as Br104 of DB of West Germany and as Br204 of DR of the communist DDR. 23 machines were made and the last one was taken out of use in 1982. This is the very first one of the series. Its maximum speed was 110 km/h and its power rating was 2190 kW. 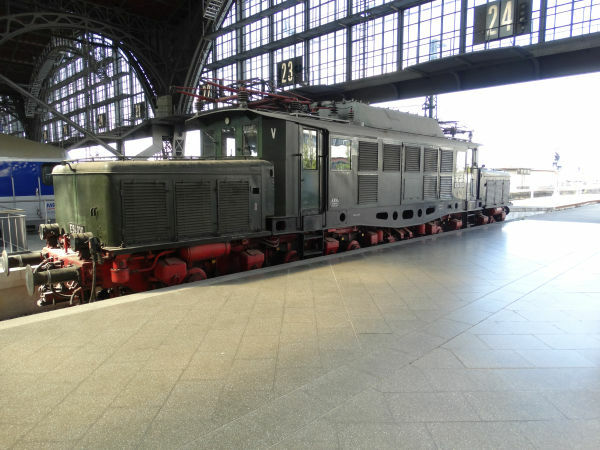 10 of these machines were at home at Bahnbetriebswerk Leipzig West for a very long time and now the very first one, E04 01 is put on display at the Leipzig main station. The electric locomotive type E44 is also from pre-war Nazi times. 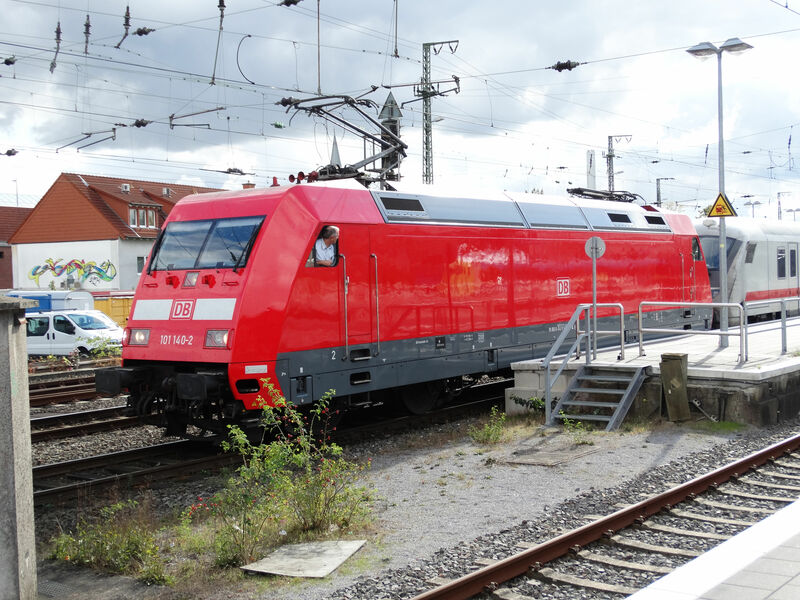 It was the first electric locomotive type of Germany which was built in more than 100 copies and it was a very technically advanced machine at the time. The first series was built 1932-45, but more of the same machines were built even as late as 1955. In West Germany they were known as DB Br 144 and Br 145 and in the communist east they were DR Br 244. The last loco, a former DR loco but classed as 144 after reunification, was taken out of service in December 1994. Its top speed is 90 km/h and it has a power rating of 2200 kW. As such it was suitable for both passenger and cargo trains. After the war Soviet Russia confiscated many of these machines from the East zone of Germany and regauged them to 1524 mm and used them in Perm for a while, until they were given back to DDR in 1952 in a desolate condition. 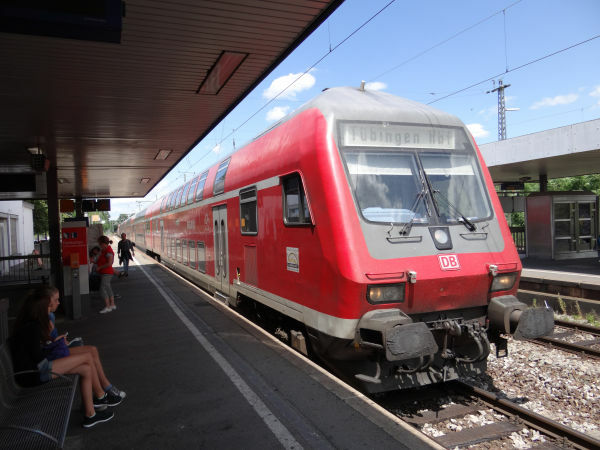 In the west these machines were used in the southern parts of the country, including Basel to Lörrach services on the Swiss border. Br 145 was a special version with rheostatic brakes, the famous Höllentalbahn near Freiburg im Breisgau was operated with them for a long time. The electric locomotive type E94 is also from pre-war Nazi times. It was a heavy cargo locomotive and a very successful type. The last ones are still in use at some private operators as this is being written in 2019. The type was known as E94 at pre-war DRG, as DB Br194 in the West, as DR Br254 in DDR and as Br1020 in Austria. It's a six axle machine which was built in 231 copies 1940 to 1956. It's top speed is 100 km/h and its power rating is 3303 kW. It's ofter referred to as the German Crocodile.